* Mariell's delicate 1 3/4" h x 7/8" w vintage drop earrings for brides or bridesmaids are glistening with pear and marquise shaped Cubic Zirconia. * Our earrings are embellished with an antique micro pave scroll motif reminiscent of heirloom wedding jewelry. 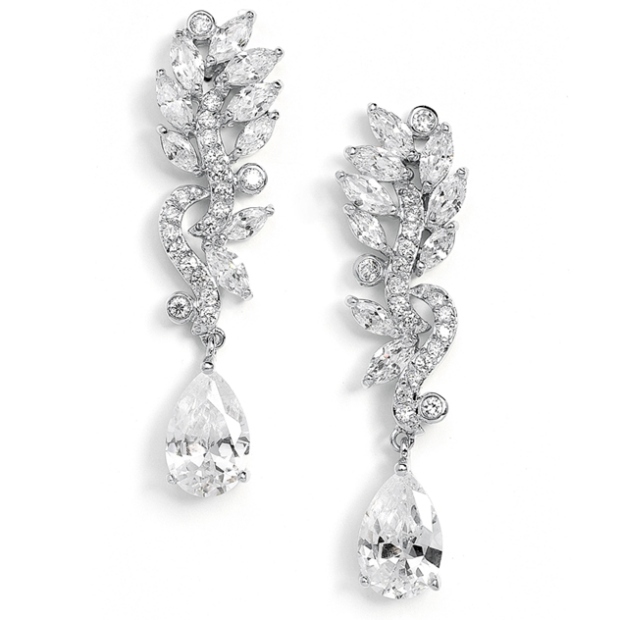 * Mariell's delicate vintage drop earrings sparkle with pear and marquise shaped Cubic Zirconia. * The brilliant hand-cut CZ stones are set in genuine silver rhodium plating containing real platinum and will stay new for years to come. * Keep these gorgeous wholesale earrings in your store's wedding display to enhance your collection of chic vintage jewelry.